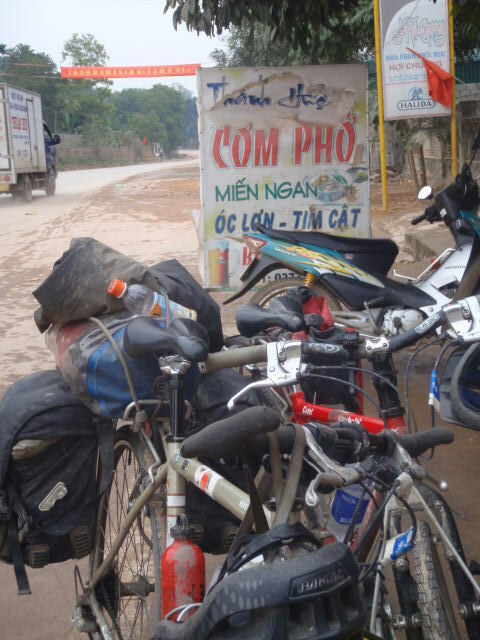 When cycling Hanoi to Saigon (Ho Chi Minh City) there are three main options (just ask googlemaps! ); one is down the dreaded (yet beach soaked) Vietnamese Highway 1; the practically deserted, beautiful but HILLY Ho Chi Minh Highway; or take a right onto the 9 into Laos and zip down the main north-south Highway 13. 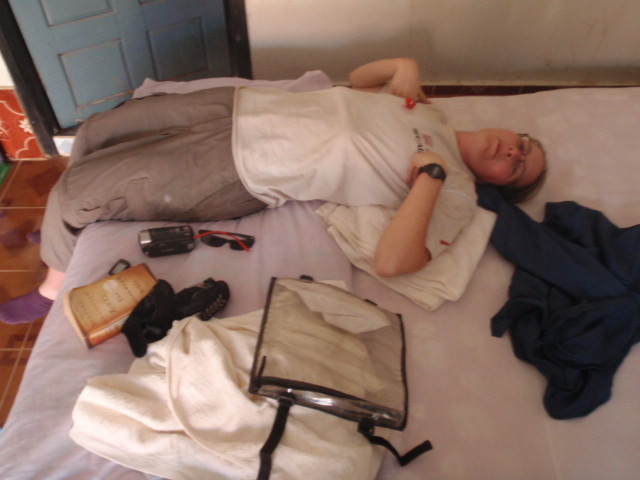 We have opted for the Laos diversion – Liz has never been so, heck, why not! The moment we crossed the border at Lao Bao we were seduced! The wide open traffic free roads, the warm steamy air simmering from the heat of the hazy sun; the mile upon mile of empty brown red scrubland intermittently dotted with grazing cows, little stilted wooden houses, and snuffling boars. Every small village we pass through the air keens with the shrill pitching ‘Sabadeeeeeeeee’s of the under 5’s. After the fuzzy excitement of Vietnam, Laos feels like a mighty exhale. With the return of warm moist days we ditch our dodgy Chinese doormen’s coats and re jig our daily schedule; now we are back to rising at 5.45am to ensure we make full use of the cool morning hours; by mid morning the sun is nipping at our exposed ankles and soon burns through our factor 50 sun block, Catherine even has a dark tan mark on her back, under her clothes! 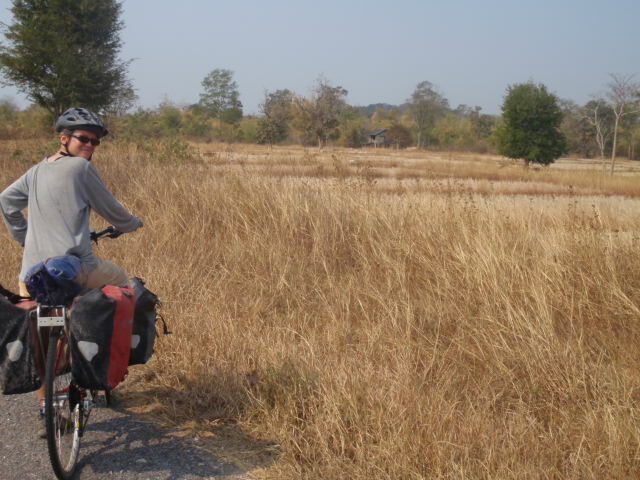 We are on a bit of a mission to make it to Savannakhet (see previous rim issue blog!) so hurry on. 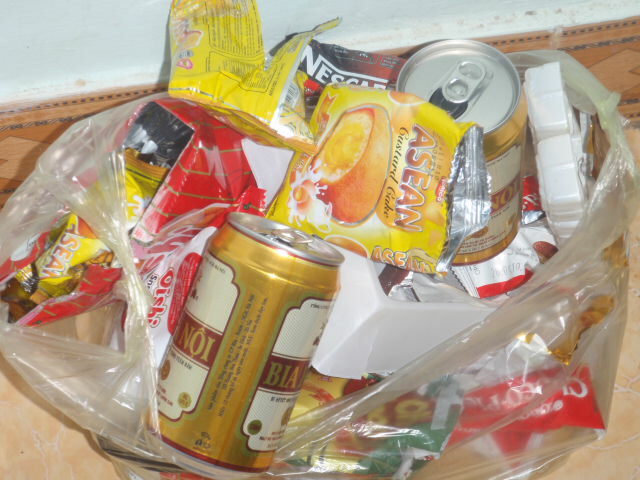 We stay at cheap roadside guest houses in basic cells offering varying degrees of cleanliness but varying degrees of little else; most have a ceiling fan, a lock on the door, a toilet and a tap. At one such establishment our walls were liberally decorated with half scrubbed out pencil drawings of women’s heads – their barely visible features eyed us suspiciously in the harsh strip lighting as we laid out our sheet bags on the rock solid bed. Yet the rooms are adequate and the owners pleasant and obliging. 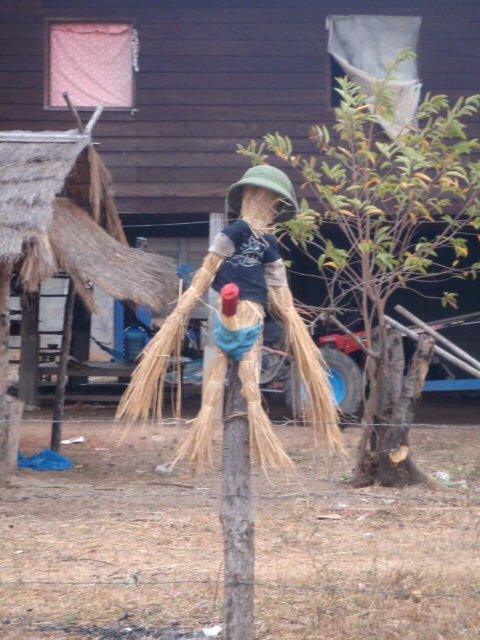 We often get the feeling we are the only clientele, until the next morning (early) when gaggles of Laotian travellers stream out of the adjacent rooms. We eat what we can at little road side shacks; a feast of son tam (papaya salad), sticky rice and an omelette is a usual evening meal – even though we try to indicate only a ‘nit noi’ (little bit) of chilli our lips and tongues usually end up pulsing shiny red as we rush to consume enough calories to get us through the next day. As the red sun sets over the distant hills, we breathe easy in the warm, clear evening air. Not for the first time on our trip do we thank the slowness of our wheels that allows us to spend our time in these seemingly dull and dusty little places; little places that wouldn’t even get a sniff in a Lonely Planet, but where we get to simply sit, sip an ice cold beer and sink lazily into Laos at is easiest. 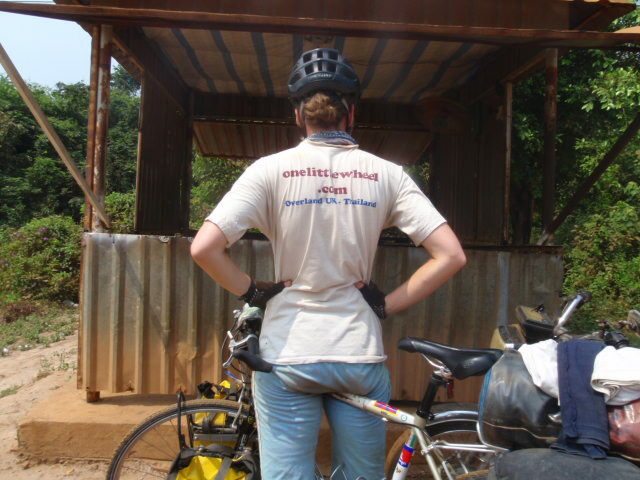 Riding the inner North – South Ho Chi Minh wiggle had been traffic light, mud heavy. The road was coated with a persistent thin film of watery mud that our back tyres kicked high up our backs and over our heads to rain orange grit down on us from above. Mud clots clumped in our hair and packed into our ears. 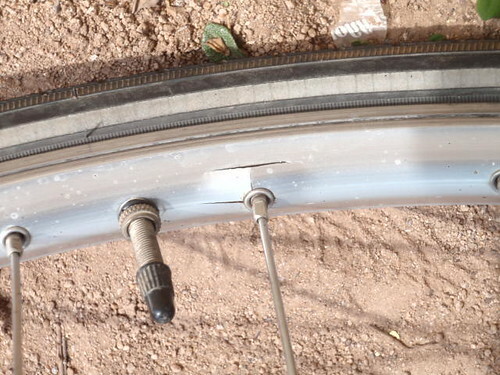 It had been a big decision not to fit the bikes with mud guards, which, on balance, was the right one; the vast majority of our days have been dry and a mud guard is yet another thing to break and yet another weight to justify – but with the road raining down on us and pop-corning up from below, it was sorely missed. Our tolerance for all things wet, grey, and cold was beginning to rub – we had been pushing south for weeks now and the sun seemed as far off as ever it was. And Tet was lurking unimaginably before us; ‘Nothing will be open’ we had been warned ‘no guest houses no hotels no food no shops no nothing no anything’. Everyone knew something, but everyone’s something was soon huffed over and out by someone elses something else. These things we did know a) Tet is New Year but is more like Christmas b) everything may be closed at some point for some indeterminable length of time. Or not. For this whole bag of reasons we decided to move back onto the other North-South vein– the 1. 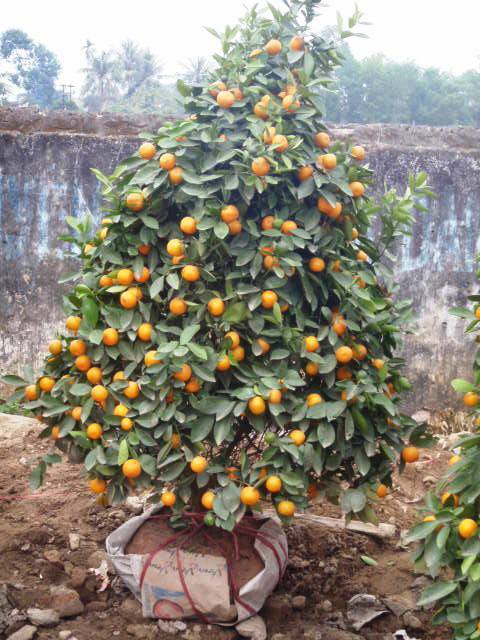 Quicker, dryer, more ‘main’, more danger; But not, thankfully, during Tet. We moved onto the 1 about a day before Tet eve, lining into it at a big knuckle town with a super market – A Big C. Lacking any further information and/or guidance other than ‘no’ and ‘don’t do it’ we decided to plan our own Tet offensive around the only fathomable time indication we could find; the Big C opening hours. Big C was closed for two full days thus, we surmised, we needed to ensure we had all our food, snack etc provisions for two full days too –after which, if Big C is back in the game surely pho (noodle) and com (rice) shacks will be too. So we stacked up with tins of tuna, noodles, chocolate and peanuts and crossed all our extremities on the accommodation front. As it turned out cycling the 1 during Tet was both a blessing and a quite literal pain in all sorts of bodily fringe areas. The road was bare; not a whiff of truck dust or roar of sleeper bus ran its glitzy neck. It was ours! While there is little of visual interest along the edge of the 1, this traffic nakedness did mean that we could ride side by side for once; a leisurely treat usually only available on the sleepiest of sleepy lanes. And (thank all the baby cheeses!) while many guest houses where closed there were a good few open; AND we even managed to blag a full cooked meal on one of our “closed” days! However in the danger void left by the traffic came a profusion of small boys wielding their shinny Tet gifts; riding high on a diet of Tet candy. With boredom and sugar crashing through their veins these small boys fell into near apoplexy when they saw us coming. For the majority of our encounters (of which there were many many) this meant nothing more than a sudden cyclonic whipping up of small-boy-tumbleweed which scuttled down the road after us for a while until it a’whooped and a’hollered itself out. But for other small-boy-clusters, those whom the Claus of Tet had blessed with shiny new cap guns, we meant target practice. A cap gun, it turned out, is a surprisingly common Tet gift; and surprisingly surprising when on a bike. 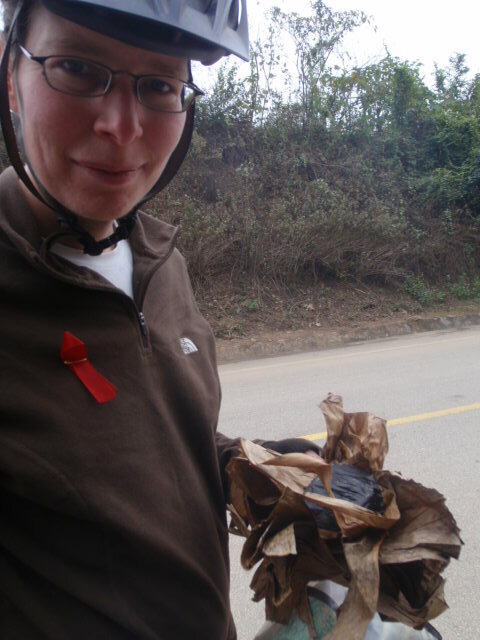 Thus, cycling during Tet turned out to be somewhat of an obstacle course – Catherine scored two hits from a cap gun, one slap on the arm, and one stroke with a bouquet of feathers; Liz scored two drunken shoulder slaps, one feather stroke, and one hit by a handful of pebbles. All, it must be noted, while we were in motion! One of the most dangerous entities on the road is a calf. With thundering trucks, impatient cars, overloaded mopeds and meandering cyclos road survival strategy is a flippedy jibbet at the best of times, but throw a calf into the mix and risk factors sky rocket. We have an overtaking policy – Liz usually cycles behind but close so when an obstacle looms she looks back and calls ‘go!’ if we are safe for an overtake. A couple of days ago, on a yet another not-so-fine day we were pedalling along a not-so-fine road when we spotted a cow and her calf sashaying up ahead, thus we assume the protocol – GO! bellowed Liz. We swept left for a pass on the outside and the calf, because it is a dangerous clattery beast, skits; obviously spooked by the sudden apparition of Us it danced out left causing me (Catherine) to skit as well (potentially because I too am a dangerous clattery beast?!) …. right into Liz. Back wheel and front collide and Liz tumbles to the ground (I’m sure the calf muffled a snigger. Beast!). Right onto ‘Death Highway’! Having survived the tumble we didn’t want her splattered by the thundering trucks, impatient cars, overloaded mopeds and meandering cyclos – so, once it was clear she had suffered no major damage we moved quickly to scoop her onto the sideway. Where upon she / bike were checked for dents / injury; a generous amount of superficial scratches and scrapes were called but beyond that all was intact. At which point I (Catherine) burst into tears and sobbed for some good few minutes before we once again ventured forth on the road we had been warned off of on more than one occasion. ‘Seriously, don’t go on it. You WILL DIE!’ Julie, an earnest curly haired Australian emphasised yet again, ‘I’ve never done it but, seriously, Highway 1 is really SOOOOooOO dangerous, seriously… DEATH!’ We nodded our assent as we continued to pack away our laptop. 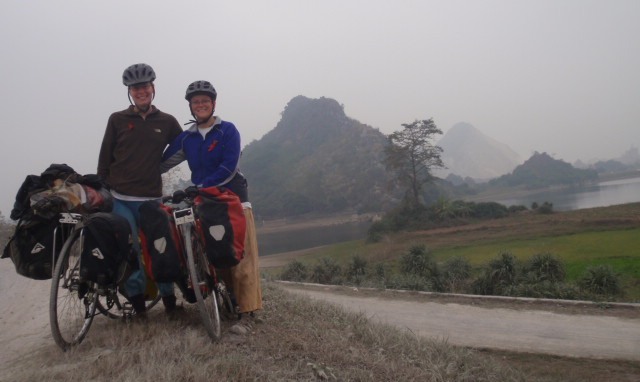 Julie was joined by Greg, another Antipodean (Hanoi schools are well populated with them) who smiled broadly, ‘Go the Ho Chi Minh, I’ve never done it, but apparently it is really beautiful. Avoid the 1 if you can. It is really dangerous’. Taking road advice is complicated. So many of the roads we have cycled down have been deemed too dangerous and sure death certificates, but have proved busy but not fatal. Most people experience roads from a bus or car perspective, a vantage that can often feel more dangerous than when on a bike; especially in countries that are used to bikes (as is the case here) where drivers are generally considerate and polite, especially truck drivers who have proved a delight the world over. Thus it can prove hard to gauge danger levels. 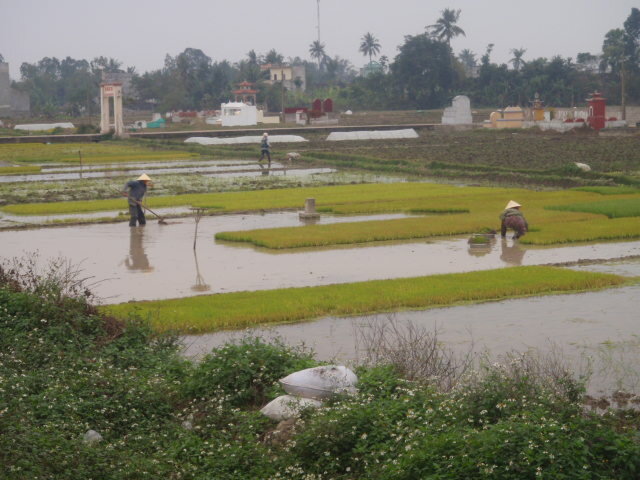 Viet Nam is a long thin country with two main arterial roads; Highway 1 that runs along the costal edge; benefits here include its relative flatness /straightness and it’s lack of malaria (not that we have even seen a mosquito yet! ), bizarrely it is also included in the Lonely Planet’s best long distance cycle rides. The second is the Ho Chi Minh Highway that runs the inside track following the supply route used by the North Vietnamese during the Vietnam War; this is shorter, but hillier and runs the malarial route. 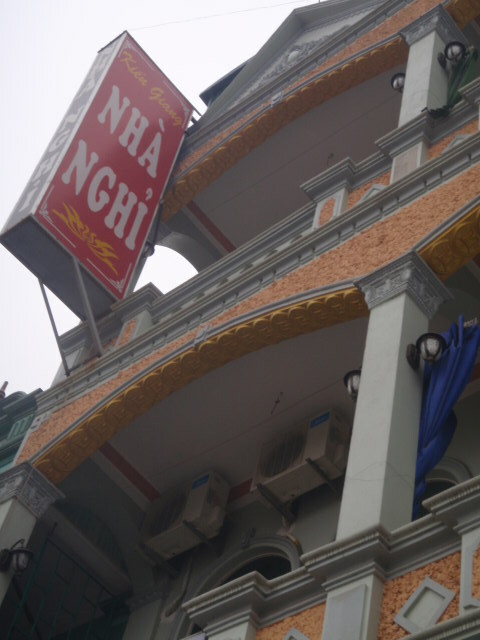 We decided to follow the Ho Chi Minh – if nothing else it sounds the more evocative of the two. But by a navigational error (sometimes the power of the Ask can prove faulty) we ended up on the 1 anyway. So we had little choice but to ride it for a day. It was as we expected; quicker but certainly more dangerous. 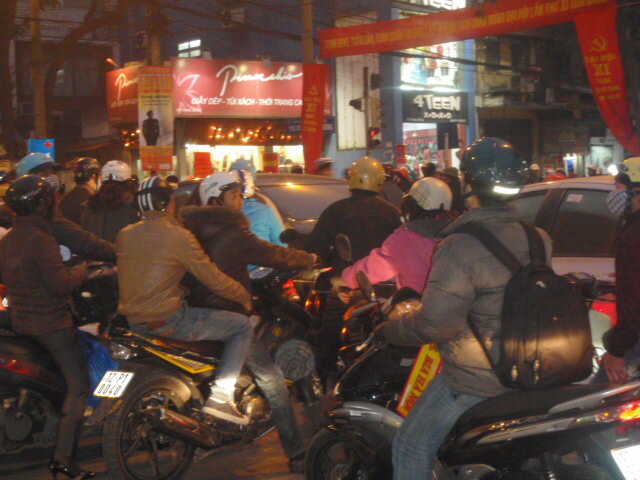 It is a highly unpleasant road because it is so busy and the constant adrenaline surges of fear really heighten exhaustion levels at the end of the day; thus we decided to end the relationship ASAP and shifted track over to the HO HO HO Chi Minh. With TET (Vietnamese New Year) looming and the constant burden of persistent wet, cold, muddy riding days it is highly likely that we will return to the 1 at some point but for now we can spend our riding hours contemplating the shear depth of pain, sacrifice and determination that the Ho Chi Minh trail represents and wonder at Vietnamese character that enables such overwhelming good cheer and good humour in the face of such a historical legacy.